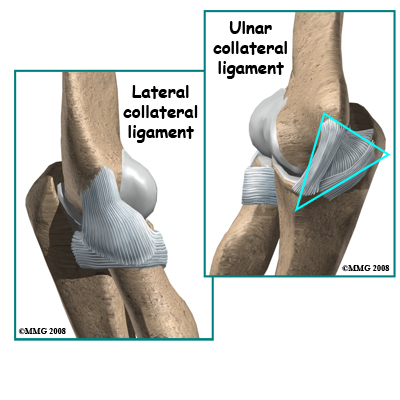 Welcome to Purposed Physical Therapy's patient resource about Ulnar Collateral Ligament Injuries. Professional pitchers have been the athletes treated most often for this problem. Javelin, football, racquet sports, ice hockey, and water polo players have also been reported to injure the UCL. A fall on an outstretched arm can also lead to UCL rupture (often with elbow dislocation). 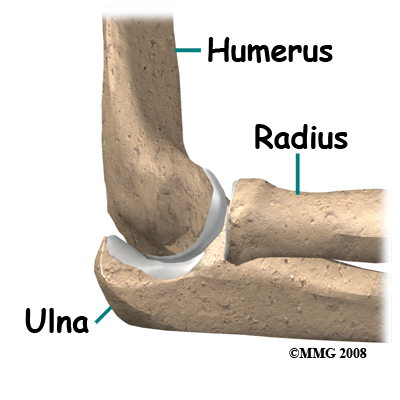 In the elbow, two of the most important ligaments are the ulnar collateral ligament (UCL) and the lateral collateral ligament. 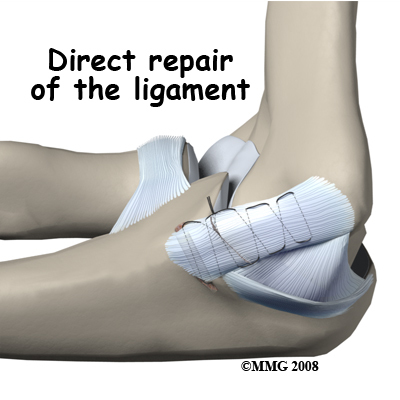 The UCL is also known as the medial collateral ligament. 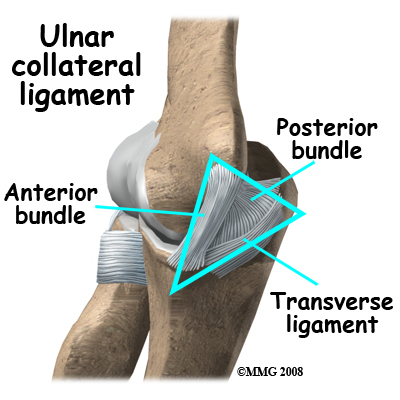 The ulnar collateral ligament is on the medial (the side of the elbow that\'s next to the body) side of the elbow, and the lateral collateral is on the outside. 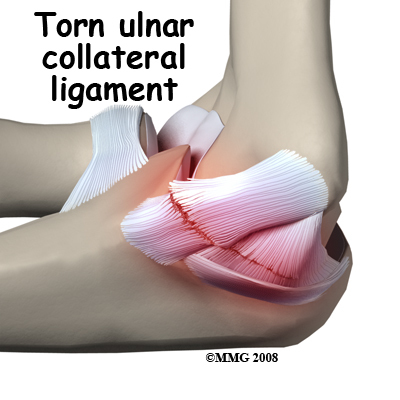 The ulnar collateral ligament is a thick band of ligamentous tissue that forms a triangular shape along the medial elbow. It has an anterior bundle, posterior bundle, and a thinner, transverse ligament. 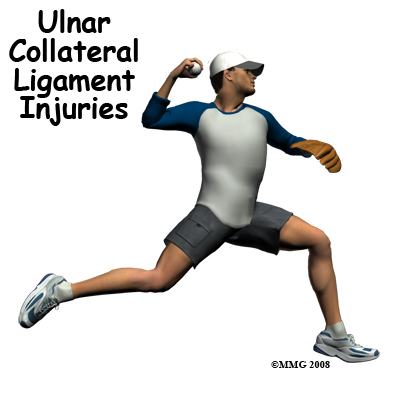 The ulnar collateral ligament can become stretched, frayed or torn through the stress of repetitive throwing motions. If the force on the soft tissues is greater than the tensile strength of the structure, then tiny tears of the ligament can develop. Months (and even years) of throwing hard causes a process of microtears, degeneration, and finally, rupture of the ligament. The dominant arm is affected most often. Eventually the weakened tendon my rupture completely causing a pop and immediate pain. The athlete may report the injury occurred during a single throw, but the reality is usually that the ligament simply finally became weakened to the point that it finally ruptured. Diagnosis is based on your history and symptoms. When you first visit Purposed Physical Therapy, we will complete an examination of the shoulder and elbow, performing specific tests to look for areas of tightness or laxity (looseness). Most patients will report tenderness along the inside of the elbow to palpation of the UCL ligament. We will perform ligament stress tests at the elbow to test for joint stability. To do this our Physical Therapist generates force toward the inside of the elbow as the joint is moved from a position of slight flexion into full extension. Too much motion or opening of the joint at the medial joint line called gapping may be observed or felt by palpation. This test also allows us to see if there crepitation (popping, crunching) as the joint moves. Many athletes with elbow instability from UCL injury can be treated successfully with rehabilitation and without invasive procedures. When you begin your Physical Therapy at Purposed Physical Therapy, we may initially recommend rest and/or activity modification (fewer pitches per game, per practice, per day). The athlete's posture, strength, and release of the ball must be analyzed and corrected. The use of curve balls should be avoided during the early phases of rehabilitation. Anti-inflammatory drugs and analgesics may be recommended to reduce pain and inflammation. Icing may help, but must be used with caution. Too much cold can cause a worsening of the swelling as the body sends more blood to the area to warm things up. And cold can be an irritant to the already damaged (and irritated) nerve. We may also use other modalities such as electrical stimulation and ultrasound with cortisone (called phonophoresis) when needed. Steroid injections are not usually recommended for this condition. Your Physical Therapist will develop a daily program of stretching and strengthening; stretching exercises for the muscles of the forearm are usually included, as well as a strengthening program for the entire elbow/arm complex. We will employ high repetition, low weight exercise training to increase your endurance without placing additional stress across the joint. We will also address any problems with flexibility, strength, and conditioning at your shoulder. Athletes will undergo plyometric strengthening of the entire arm, starting with the forearm muscles (flexors and pronators) and progressing to include the biceps, triceps, and rotator cuff of the upper arm. Plyometrics refers to training the nerves to fire quickly and the muscles to contract strong and fast. Plyometrics help develop explosive movements to improve muscular power and force. The goal is to increase the speed of the pitch (or throw for other throwing athletes). When you begin your post-surgical rehabilitation program at Purposed Physical Therapy the type of program prescribed will depend on the types of surgery that you underwent. After arthroscopic debridement, we will start you on gentle range of motion exercises right away. Full motion can be restored as the pain and swelling resolve. 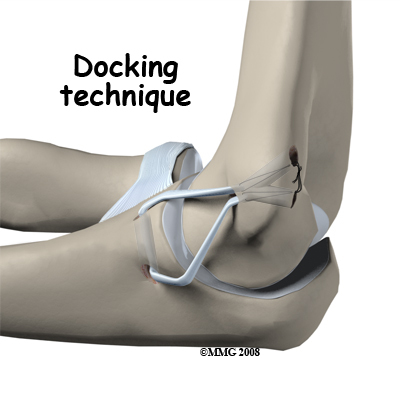 Elbow strengthening exercises are begun within the first few days to week after the procedure. As your rehabilitation program progresses, a gradual throwing program will be included. Although the time required for recovery varies, full sports participation can usually be anticipated within one to three months. The postoperative program is the same for repairs or reconstruction. However, your arm will initially be immobilized in a bulky dressing. Gentle handgrip and shoulder and wrist mobilization exercises are usually allowed right away after surgery. We often discontinue postoperative immobilization in seven to 10 days at which time active range of motion for the elbow is started. Your surgeon may want you to wear a special hinged brace to protect the elbow. Your Physical Therapist will instruct you in the active range of motion exercises to be done daily. Strengthening exercises for the entire upper quadrant (shoulder, arm, wrist, and hand) are included in the post-operative program. Specific strengthening exercises to help the athlete prepare for his or her particular sport begin around four months post-op. Up until this time, any stress to the medial elbow is avoided. Magnetic resonance imaging (MRI) with contrast dye is used to diagnose ligamentous rupture. The test doesn't always show a problem when there is one. This is called a false-negative result. Ultrasound and CT scans may be helpful. 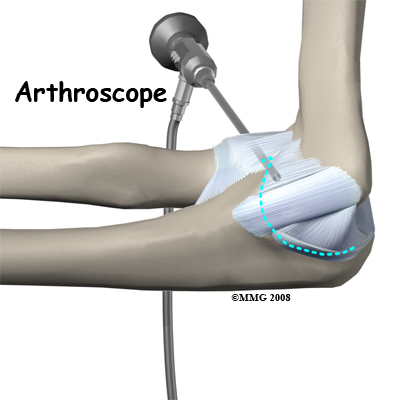 Some surgeons prefer to use arthroscopy to make the final diagnosis. The presence and severity of valgus gapping can be confirmed. Studies using these more advanced test methods to diagnose UCL injuries are being done. More data is needed before they become routine in the diagnosis of UCL injuries.